One of the most familiar and easiest ways to alter the pitch is to change the speed of the recording. Faster will increase the pitch, while slowing down the recording will lower the pitch. The most recognizable example of altering pitch is the very popular “Chipmunks” that (used to) use sped up vocals to produce the Chipmunk sound. Modern ways to manipulate pitch are much more complex, but the idea is still very similar. The guitar tuner is not an effect, but it does read the pitch of the guitar signal. 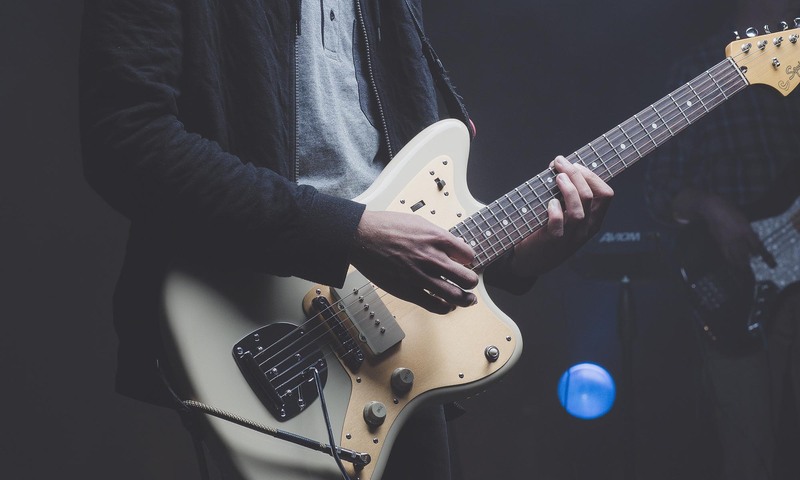 A Tuner will let you know through meters or LEDs how close your guitar signal is to the desired pitch. In my opinion, the Electronic Guitar Tuner is one of the most useful, important, and in my experience underused devices that detect and use pitch. Many of these devices are very inexpensive and you can check your pitch by clipping it right onto the guitar with no need to plug it in. Take a look at the Korg GA1 Guitar and Bass Tuner, or the Fender Clip-On Tuner FT-004 for Guitar, Ukulele, Bass, Violin, Mandolin, and Banjo. The Octave Pedal is a type of Pitch Shifter pedal that shifts the pitch of a note up or down one Octave (sometimes two or even three octaves). The octave sound can often be blended with the original, or the original can be completely removed. Octave pedals are often used to simulate a Bass Guitar, or to make the guitar stand out more with the Octave Up blended in. The Octave effect is also often paired with the Fuzz effect, but the Octave in these devices is oftentimes much more subdued. Take a look at the Electro-Harmonix Octavix Octave Fuzz Pedal, or EarthQuaker Devices Tentacle Analog Octave Up Effects Pedal. The Pitch Shifter is an effect that changes the pitch of the note that you are playing. It is very similar to an Octave pedal but it offers more intervals than just the Octave and it can often achieve the effect over many octaves. One great use for a Pitch Shifter is if you are in a cover band that plays a lot of songs that are tuned 1/2 step lower, and a lot that are in standard tuning. With a Pitch Shifter you can drop the tuning a half step instantly, and return to standard tuning instantly with the press of a button. Pitch Shifters are considerably more complex than Octave pedals, and as a result these effects are more likely to be of the digital variety than analog circuits. With digital circuits, a very high speed analog-to-digital converter is very important and it is something that the digital world is just now starting to be able to achieve. Take a look at the Electro-Harmonix Pitch Fork Guitar Pitch Effect Pedal, or Digitech DROP Compact Polyphonic Drop Tune Pitch-Shifter. The Harmonizer pedal is the next step for Pitch Shifters. Instead of simply changing the pitch of the note that you play, Harmonizers seek to create complex harmonies that are in Key with the music that you are playing and they are often polyphonic. Playing one note can sound like a chord or a wall of guitars. Harmonizers are also great for Vocals. Because Harmonizers require complex logic to keep the harmonies in key, almost all of these effect pedals are digital in nature. Take a look at the Boss PS-6 Harmonist Pedal, or TC Electronic Quintessence Pedal. The Pitch Correction effect, often called Auto-Tune, is the next level of the Digital Harmonizer pedals. Pitch Correction usually allows you to choose the Key of the music that you are playing in. It then analyses the notes that you play or sing, and if the notes are not in Key the unit will automatically shift the note to the nearest correct pitch. This effect, which is very controversial, is used much more often with vocals than with guitar, but if used correctly, can be very helpful to a musician. Take a look at the TC Helicon VoiceTone Mic Mechanic 2 Reverb, Delay, & Pitch Correction Pedal, or TC Electronics Singles VoiceTone C1 Vocal Effects Processor.